Effectively managing medication use in the operating room (OR) has long been a challenge for hospital pharmacy. The lack of a direct pharmacy presence in the OR often requires other health care providers to handle medication-related issues that would be best addressed by a pharmacist. ASHP has stated that pharmaceutical services in the OR, including medication-use control, should be provided by those best suited to manage these practices—pharmacists.1 In some facilities, this oversight has been established through the development and implementation of an OR satellite pharmacy. Such programs also can reveal unexpected benefits. Located on Florida’s Space Coast, the Health-First health system consists of four not-for-profit hospitals, including the 514-bed Holmes Regional Medical Center. Holmes Regional first implemented OR satellite pharmacy services in 1989 and at that time, the impetus was to gain better control over narcotics use in the OR. 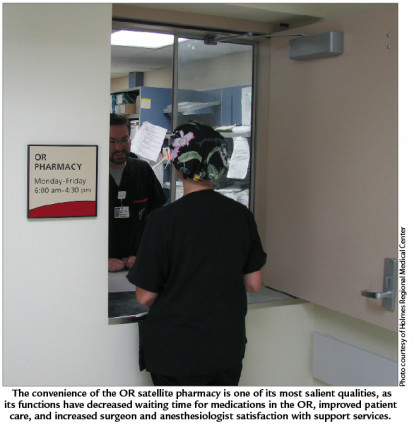 As a result of the prodigious success of our OR satellite pharmacy in improving the management of controlled substances, the satellite expanded its mission to include increased regulatory compliance and pharmacy oversight of all medications used in the OR as part of a long-term plan to improve patient care. The majority of surgical medications used at Holmes Regional include narcotics, preoperative antibiotics, solutions for immediate use, and injectables. For each surgical case, the satellite pharmacist prepares a bag that includes the surgeon’s preference card—a detailed list of the surgeon’s preferred sutures, knife blades, instruments, and drugs—as well as the required medications, and labels each bag electronically. The electronic labeling system ensures each patient is billed accurately by allowing immediate capture and documentation of patient charges, and also eliminates the potential for transcription errors that arise with manual labeling. The bags are then distributed to the pre-op holding room or picked up by the circulating OR nurse as the patient leaves the holding room on the way to surgery, and delivered to the OR suite. After the surgery is completed, the first postoperative orders are scanned and sent to the pharmacist in the satellite to be prepared. In order to control costs, our OR satellite pharmacy initially purchased a hood to use for compounding, rather than a glove box or barrier isolator. This choice, which dates prior to USP <797>, was not ideal as the lack of a barrier isolator precludes compounding any medication not for immediate use. To remedy this, we are currently in the process of evaluating and purchasing a glove box that will allow us to extend the beyond-use dating for our compounded medications. Currently all medications prepared in the OR satellite pharmacy are for immediate use in the OR. A compounding aseptic isolator (CAI) is especially advantageous when compounding antibiotics, as it allows for the production of an entire batch of frequently used products at one time. 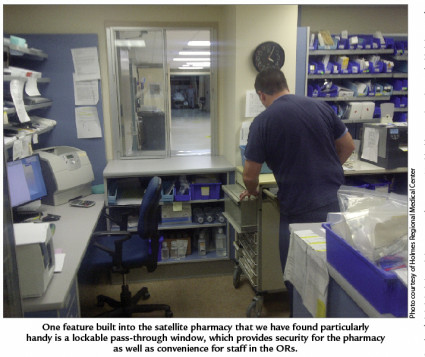 One feature built into the satellite pharmacy that we have found particularly handy is a lockable pass-through window, which provides security for the pharmacy as well as convenience for staff in the ORs. An anesthesiologist can simply walk up to the window, order a set of medications, and the pharmacist can accommodate the request immediately. The location of the satellite pharmacy in relation to the operating suites is particularly important. Choose an area that will provide pharmacy with sufficient counter space, a laminar flow hood, and a refrigerator. The pharmacy should be situated in close proximity to the ORs where the majority of activity takes place. Holmes Regional’s OR satellite is located in front of the nurses’ station and adjacent to the preoperative holding room and the OR suites. When pharmacy’s assistance is required, medications are delivered directly to the requestor or suite. The convenience of the OR satellite pharmacy is one of its most salient qualities, as its functions have decreased waiting time for medications in the OR, improved patient care, and increased surgeon and anesthesiologist satisfaction with support services. and ends approximately an hour after surgeries are complete. Thus, pharmacy arrives at 6 am to set up, prepare the first round of antibiotics for the preoperative holding room, and dispense the narcotics each anesthesiologist will require that day. The number of surgeries is generally heaviest in the morning hours, so at 2 or 3 pm our staffing levels decline to correspond to the volume of surgeries. One staff pharmacist is available during the early hours, while a technician is added during the peak afternoon hours for support. While the pharmacy closes officially at 4:30 pm, staff usually remains for the aforementioned hour or so to prepare the pharmacy for the next day. During off hours, an ADC in the center of the OR is stocked with frequently used items that can be obtained by nursing for emergency cases. The main pharmacy is opened 24/7 for all other needs, including IV admixtures, irrigation solutions, etc. All of our pharmacists at Holmes Regional are trained in OR procedures and work shifts in the OR satellite pharmacy as well as the central pharmacy. The satellite pharmacy is unique in that it is a fast-paced, dynamic, high-pressure environment that differs significantly from central pharmacy operations. Given that the working conditions are perhaps more intense than other types of pharmacy work, personalities that thrive under pressure and are not squeamish are the most successful in the OR setting. Nevertheless, all our pharmacists are trained to work in the OR setting so that in an emergency, any pharmacist is capable of working in this capacity. Increased narcotic control was the initial driver for establishing an OR satellite pharmacy, and since its opening, narcotics have been effectively managed using a highly successful, homegrown method. Before their shifts begin, each anesthesiologist is issued a small medication box that contains all controlled substances that have been ordered for that shift. This lockable, padded metal box provides convenience as it fits in a lab coat pocket and can be easily transported. Anesthesiologists and CRNAs are responsible for recording which patient received which drug, the name and dosage of the drug, and any waste generated, as well as the signature of the staff member who witnessed the wasting. When the boxes are signed out, the anesthesiologists’ signatures are witnessed and cosigned by a pharmacist and copies of the signed statements are retained by pharmacy. After their shifts, each anesthesiologist returns their box to the OR pharmacy where the pharmacist verifies it for accuracy and restocks it with the next day’s medications. The medication box must remain on the person throughout the shift or be secured in a locked medication locker. Periodic audits of anesthesia records against the proof-of-usage reports also take place. Any identified discrepancies are investigated by the chief of anesthesia and myself as director of pharmacy. This narcotic control method has been very effective at Holmes Regional—in the 20 years since implementation, cases of bonafide diversion have been extremely rare. The facility recently underwent a TJC audit and received high marks in the area of narcotics control. The auditors were impressed with our process because it is customizable and specific to policies and procedures. Nevertheless, due to increasing demands on the OR satellite pharmacy, including additional duties previously delegated to anesthesia technicians, the decision was recently made to update this manual system of narcotics tracking by implementing electronic anesthesia stations in the ORs, a system that is slated to go live at the end of 2011. Anesthesiologists will retain their narcotic boxes as we transition to the new process. If all goes well, we will eliminate the need for boxes after a month or so. We anticipate that the bar code verification capacity of the new electronic technology will simplify workflow and increase charge capture rates in addition to providing greater security control. Pharmacy is eager to witness how this new technology will impact overall narcotic use and improve patient care in the coming years. The hefty costs resulting from surgical complications are well known; surgical complications account for 2.4 million days of patient hospital stays at a cost of $9.3 billion dollars in the US each year.2 The Surgical Care Improvement Project (SCIP), a Centers for Medicare & Medicaid Services (CMS) initiative (introduced in partnership with the Agency for Healthcare Research and Quality, the Centers for Disease Controls and Prevention, the US Department of Veterans Affairs, The Joint Commission, and others), aims to reduce surgical complications through evidence-based care.3 SCIP sets guidelines to help hospitals reduce the incidence of the major contributors to surgical complications—postoperative surgical site infections, perioperative cardiac events, deep vein thrombosis, and postoperative ventilator-associated pneumonia. Adhering to the SCIP guidelines is often challenging for hospitals due to the extensive CMS reporting requirements. However, these guidelines must be followed, as deficiencies in identifying and preventing errors can contribute to patient harm and also impact reimbursement. For example, the core measure “SCIP Inf-1” requires that a prophylactic antibiotic be administered within one hour of the first surgical incision. 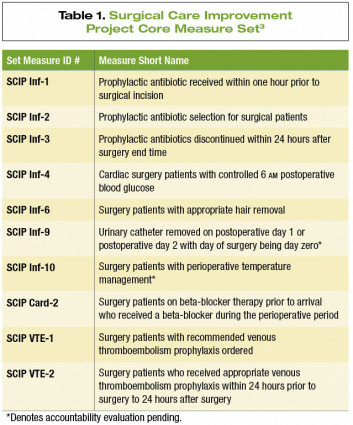 (See Figure 1 for a full set of SCIP core measures.) Hospitals often struggle to fulfill this requirement due to lack of availability of the medication in the preoperative holding area. The OR satellite pharmacy ensures these doses are delivered on time and ready to be administered within one hour of each surgery, making compliance more easily accomplished and lessening the chance that patients will experience surgical complications. Clearly, the presence of a pharmacist in the surgery and anesthesiology areas helps improve adherence to TJC standards as well. Pharmacists must review medication orders; control the preparation and dispensing of medications; ensure that emergency medications are available, controlled, and secure; and monitor the effects of medications on patients. Working directly alongside surgeons and anesthesiologists, OR satellite pharmacists are in an ideal position to ensure the mediation-use process is safe and in compliance with TJC regulations. The OR satellite pharmacy also has allowed pharmacy to more effectively manage the formulary. In the event that a physician orders a medication that is not listed on our closed formulary, the satellite pharmacist is in an ideal situation to intercede and educate the physician on drug choice. The convenient location of the satellite pharmacy permits immediate, face-to-face access to the prescriber. By nature, the OR is a closed environment. 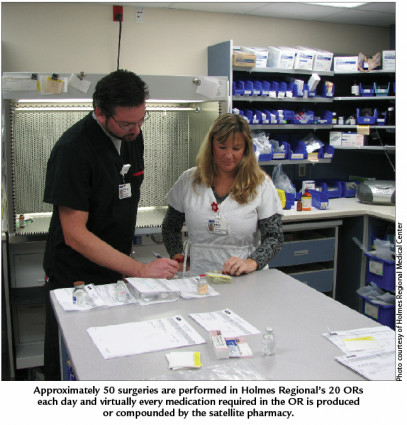 At Holmes Regional, after the initial OR satellite pharmacy implementation period, it quickly became apparent that the value the pharmacy brought to the OR was growing exponentially beyond its original intent of narcotics control and guidance on cases when necessary. To meet the growing demand we increased our services to include comprehensive, full-scale, medication-use review of all medications used in the OR. Since that time, both surgery and anesthesiology have become increasingly dependent on the satellite pharmacy’s services, underscoring the project’s widespread success at our institution. Recently, the facility’s OR suites required extensive renovation, and during this period the construction required the OR satellite pharmacy to close for a brief period. The consternation expressed by the anesthesiologists, nurses, and surgeons as a result of this closure highlighted the value of the program to administration. The OR satellite pharmacy had become an integral service that staff was not willing to give up. Pharmacy’s presence in the OR environment clearly impacts not only narcotic control, but also regulatory compliance, patient safety, and the overall quality of patient care. Although some published studies have reported cost savings generated by OR satellite pharmacies, this has not necessarily been the case at Holmes Regional, and therefore is not a strong justification for adoption. In our experience, the most legitimate justification for implementing OR satellite pharmacy services is as a quality initiative that increases safety and improves patient care. Seek support from key individuals from the principal departments affected by the service, including anesthesiology, surgery, the OR, and the postanesthesia care units. Illustrate how workflow will improve as a result of OR satellite services. Identifying any anesthesiologists who have previous experience working at facilities with OR satellite services and soliciting them as project champions can be especially persuasive in gaining departmental and administrative buy-in. Working jointly with anesthesiology to create and present a formal proposal may be the preferred route to convincing administration of the value the satellite OR pharmacy will bring to the organization. Schedule a site visit at a nearby facility that is successfully utilizing OR satellite pharmacy services. Experiencing the service and its benefits in action can powerfully affect any key stakeholders who remain unconvinced of the program’s utility. If administration expresses concerns regarding the costs of implementing an OR satellite, suggesting a temporary pilot program can be particularly effective in justifying the need for this service. Roll out the service in several ORs or one specific surgical specialty to start; establishing a permanent satellite pharmacy would be contingent on the success of the pilot program. Experience has shown that after witnessing first-hand the improved medication management, security, regulatory compliance, patient safety, and convenience factors, administration may be more likely to recognize, support, and approve the initiative. Whether a facility would be able to support an OR satellite pharmacy depends largely on bed size and the number of surgeries performed per day. For example, in the Health-First health system there are four hospitals and only Holmes Regional, the largest, has an OR satellite pharmacy. The other three facilities are licensed for between 80 and 150 beds each and perform fewer surgeries, thus the majority of OR medication needs are managed successfully by the central pharmacy using a tray exchange system supplemented by ADCs. However, for facilities performing 20 or more surgeries each day, it may be prudent to consider adding a satellite pharmacy in the OR area. The OR satellite pharmacy project has become one of the pharmacy department’s most appreciated initiatives. In addition to creating and reinforcing a spirit of cooperation and unity between anesthesiology and pharmacy in the medication-use process, the OR satellite pharmacy has helped improve the compliance rate for surgical care and infection prevention to 98%, and also contributed to high marks for choice of antibiotic. The increased costs necessary to operate the satellite pharmacy pale in comparison to the value it brings to patient safety and improved OR workflow. Holmes Regional has successfully operated an OR satellite pharmacy for almost 20 years, and with the addition of additional technology, including the automated anesthesia stations, we anticipate the OR pharmacy will bring increased value to the facility and improved patient safety for years to come. Michael A. Edwards, PharmD, received both his BS and PharmD from the University of Florida. He worked as a staff pharmacist for several years at Holmes Regional before becoming lead in the OR satellite, and was then promoted to pharmacy supervisor and then operational manager. Michael is currently corporate director of pharmacy for all of Health First, which includes four inpatient pharmacies and one outpatient pharmacy. American Society for Health-System Pharmacists. ASHP guidelines on surgery and anesthesiology pharmaceutical services. Am J Health-Syst Pharm. 1999;56:887-895. Zhan C, Miller MR. Excess length of stay, charges, and mortality attributable to medical injuries during hospitalization. JAMA. 2003;290(14):1868-1874.